Visium Resources’ reputation has been built through providing the highest caliber of IT staffing solutions and talent to our clients. Our many successes are highlighted by achievements such as: being awarded multi-million dollar contracts as the prime IT staffing provider to the Kennedy Space Center Operations Center, selection as the prime staffing provider for a highly sophisticated audio-visual systems network for commercial airlines and participation in and supporting numerous US Department of Defense related projects and clients throughout the nation. We specialize in locating hard-to-find information technology talent to put our clients’ projects into action. Visium Resources has proven success in providing the highest level of IT staffing satisfaction, which is why we were chosen as a Best of Staffing Award winner in 2019. Whatever you need, Visium Resources is here for you. Central Florida's Choice for IT Staffing Solutions. 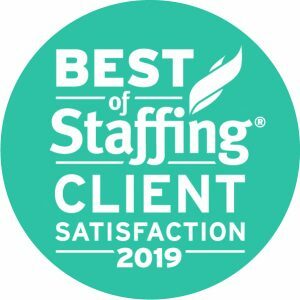 Visium Resources was proud to receive the 2019 Best of Staffing Award for Client Satisfaction. Request staff today and see what we can do for you! Visium believes that the perfect candidate requires more than just basic skill sets, but rather a complete synchronization between company culture and each candidate’s career goals. Through our long history of success in the IT staffing industry, we have found that when you match a candidate based on more than skills, they have higher job satisfaction and increased duration of employment. Visium understands the ever-changing supply and demand of IT skills. To identify a good match, Visium utilizes a consultative approach with both client and candidate, attempting to align candidate financial requirements with your budgetary thresholds. While we have found that the best value often comes from local candidates, however we often find it necessary to augment this talent pool by casting a wider net, especially when looking for niche skill-sets. Have a tough IT Staffing Problem? It won't be for us at Visium Resources! Talk to one of our knowledgeable IT account managers today and take the first step to filling your IT position!